I had a wonderful call today from artist Craig Tracy. 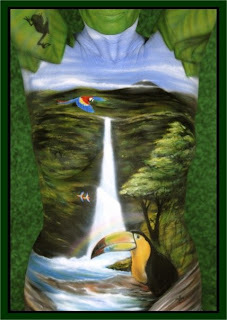 If you love body art paintings like I do you can not but love the artworks created by Craig. His fine art can be purchases in his art gallery Painted Alive aka Craig Tracy Gallery in the French Quarter. If you're in that area it is a must stop place to shop. When I first met Craig was able to spend a few days with him and I came away truly more centered as an artist, as I love to create body art paintings but too I love creating mixed medium artworks. In spending time with Craig who is an artist in his very fiber and soul I knew I had to find my real art, the art that inspired my soul and tingles my fibers. He is not a humble man, he is outspoken and says it like it is. I like that. He is a strong man, a strong artist, a sensitive artist moved by the art of others and who lives to create and move this art form forward, for the love of art.